I think that this time of year with all its Religious Holidays is a most appropriate time to do a Missive about the Bible. 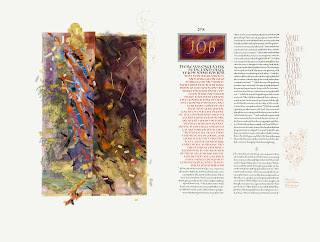 The one I have in mind is the subject of the exhibition “Illuminating the Word: The Saint John’s Bible”. At the New Mexico History Museum, pages from two sections of the Old Testament are shown in Santa Fe while other selections are being presented in venues around the country. It did sound to me as a bit of a yawn but it got so much attention and positive reviews that I went to see for myself. On first viewing, it hit me as important but I could not immediately comprehend why. Reduced to its essence it is an amazing visual work of art. When you go into the subject further you realize there are so many aspects to the creation of this bible that several books have already been devoted to the subject. Here is a revival of the lost art of manuscript illumination that brings the texts to life with compositions using cross cultural, scientific, realistic and abstract imagery intermingled in broad passages of color. Note in the page from Job not just the use of abstraction and color representing his decline on the right but also, best seen in the original the detailed items representing his earlier wealth at the left; or the bones, skulls, eyeglasses and even a junked car in the detail from “The Valley of the Dry Bones” (Ezekiel 37: 1-14 ); or the amazing integration of words and images of death in the beautiful pages from Ecclesiastes. The exhibition was conceived by Thomas Leech, curator of the Press at the Palace of the Governors (part of the History Museum). He became passionate about the idea after hearing a talk by Donald Jackson, scribe to Queen Elizabeth II. 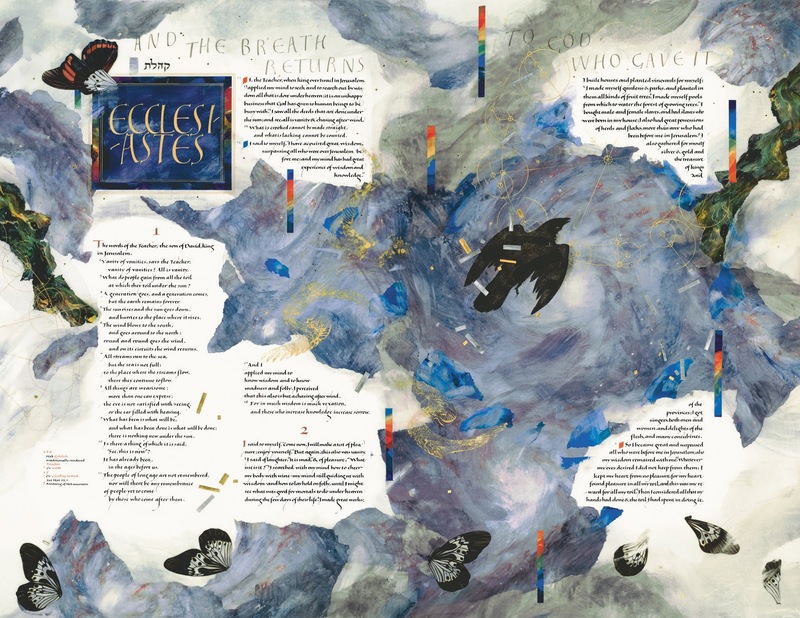 Jackson ,was born in 1938 in Lancashire, England, and had a dream since childhood of creating his own illuminated bible. 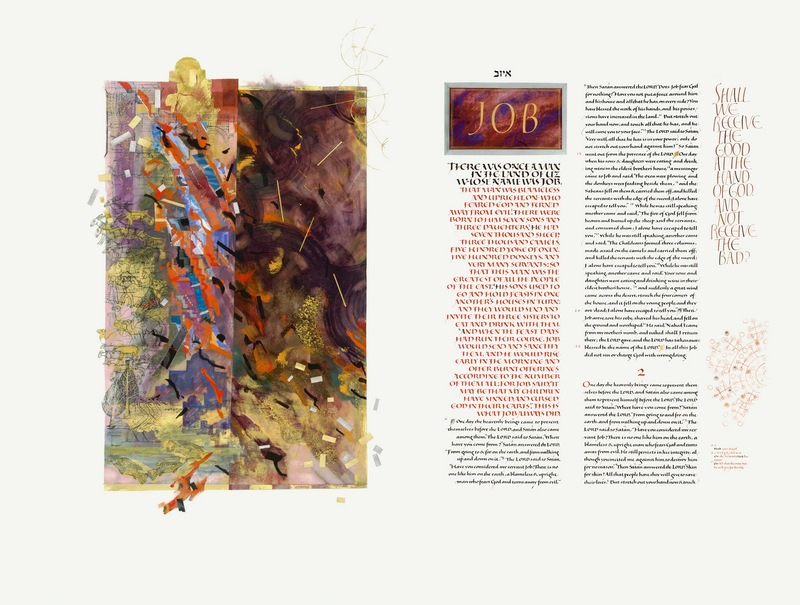 In 1994 he was invited to a calligraphers’ retreat at Ghost Ranch (where Georgia O’Keeffe spent summers) and it was there that he did the first mock up for his illustrated bible with a sketch, Christ in the Desert. This was not to be an illustrated bible depicting the scenes referred to in the text, but rather a contemporary interpretation. 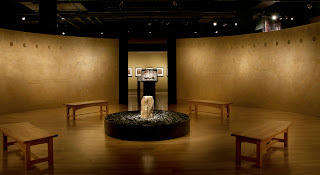 In 1996 Jackson presented his concept and sketch to the Benedictine Order of Monks at St. John’s University and Abbey in Collegeville, Minnesota. Having seen the great losses of treasures during World War II, the monks had embarked on a program to preserve manuscripts through the centuries. They travelled the world and recorded the originals on microfilm, or whatever media was available at the time, in order to have a place where the written word would never be totally lost. This was the perfect fit for the first illuminated bible to be commissioned since the Saint James’ Bible which was published in 1611. After the monks agreed to get behind the project they raised the necessary funds from private sources. Originally, budgeted at one million dollars the costs eventually went way beyond that. The project itself is mindboggling. Jackson had to assemble an international team of artists, scribes and theologians whose first task was to decide on which version of the bible to use. They decided on the “New Revised Standard Version” which was accepted by Protestant, Anglican, Roman Catholic, Eastern Orthodox Churches. The images had to be approved as appropriate by The Committee on Illustration and Text, which included artists, art historians, medieval historians, theologians and biblical scholars and then integrated with the text. Once the committee approved, the artists were given some leeway. The scribes and illustrators worked in Jackson’s scriptorium in Monmouth, Wales. They used a unique script he created for the project that varied only slightly form scribe to scribe. Although they wrote with quills on vellum they needed to use computer technology to set up the pages of this colossal collaborative undertaking and decide where each would begin and end. I cannot leave this exhibition without commenting on the superb installation. It is done in the round with an independent but relevant photo exhibition on the outside walls curated by Mary Anne Redding and depicting locations in New Mexico associated with religious faith. The center of the show consists of a round room for contemplation with benches around and a circular rock fountain. On the outside of the walls of the meditation room is didactic material including many of the sketches and materials used to create the bible. The individual folio pages, which will be bound into seven volumes after all the exhibitions are done, are shown in free-standing cases. The labels give the names of the artist and the scribe (Donald Jackson sometimes acted as both), as well as a reference to the biblical passage and a discussion of the imagery chosen. The installation created the perfect environment in which to appreciate Donald Jackson’s amazing creation, until it is bound and hidden for generations.